From stem to stern, everything about the Formula Bow rider series is designed to meet your needs and maximize your fun and relaxation on the water. This is where excellence meets sophistication, and superiority meets authenticity. The 290 Formula Bow rider is our second largest upscale sport boat, one that combines Formula prestige with your personal touch. Crystal Blue Flagship Hull-sides with Almond accent 290 is powered by twin Mercruiser 6.2L 300 ECT B3 DTS sterndrives. Garmin Chirp 54cv Chartplotter, 12V Battery Charger, JL Audio lighted cockpit speakers, porcelain head with pumpout, Electric Windlass, Bow backrest and filler cushions, Bow Docking Lights, Fender clips, VHF Radio, Fiberglass Arch, extended Sport Swim Platform, Blue LED Cockpit lighting system, Corian Ravine Wetbar, Ski Pylon, SS Flag Staff, All Weather Bow and cockpit cover, Latte Bimini Top, Aged vinyl Teak on plaform and Woven cockpit Mat in Morning Sand color round out the optional equipment. Contact Capt. Denny at +1 239-470-3589 email denny@formulaboatssouth.com Call or Text! 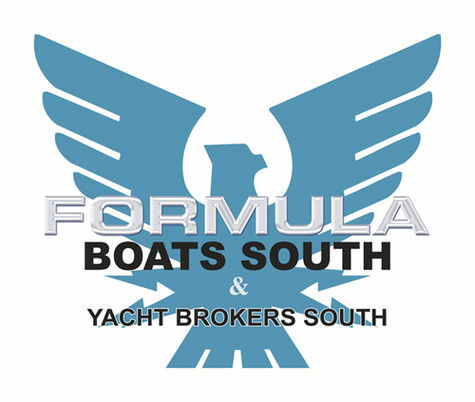 Formula Boats South, Inc.is a Retail Agency for Formula Boats in the South USA. All factory inventory, new and trade in, wherever located is available for sale with delivery to a local service provider included. We are represented in Marco Island, Naples, Ft. Myers Beach, Cape Coral, Punta Gorda, St. Petersburg, Pompano Beach and Miami, FL.